Carrie Bodle: Sewing Sonifications Performance :: October 10, 2009; 2:00 – 6:00 pm :: Westlake Park, Seattle, WA. Visual and sound artist Carrie Bodle will create a five-channel sound installation and sewing performance sonifying data from an ecosystem model developed by UW oceanographic scientist Dr. Neil Banas. 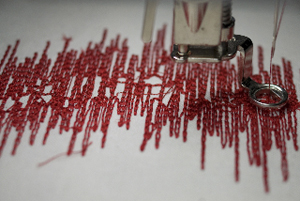 Sound is translated from data, then visualized and made tactile by the artist embroidering the combined waveform into a continuous sound wave. This computer model simulates the growth and consumption of plankton in the ocean ecosystem along the Washington coast during summer 2005. The five sound channels broadcast five dimensions in this data: wind (1) and tides (2) drive the currents and turbulence that bring nutrients (3) to the surface. Once in the zone where sunlight penetrates, phytoplankton (4) grow, zooplankton (5) eat the phytoplankton, and so on up the food chain. Embroidering these five sonified data sets as one ecosystem through a public art performance, research data from the Washington coast is made audible, visual, and tangible. In collaboration with Dr. Neil Banas, UW Applied Physics Laboratory, and Keith Grochow, UW Department of Computer Science and Engineering. ArtsSparks is made possible by a unique partnership between the Seattle Parks Department, Seattle Office of Arts and Cultural Affairs, and 4Culture’s Site Specific Program.